We’re your local Virginia pet fencing experts and distributor of the remarkable Pet Stop® electronic dog containment systems. We have over 18 years experience keeping pets safely and securely contained and we’re confident that when you choose a professionally installed hidden electric pet fencing system from us, you’re getting the best pet fencing system available at the best value! The safety and security of your pet is our top priority. Give us a call today to find out how we can help give your pet the freedom they deserve while giving you peace of mind. Have you thought about installing an underground electric dog fence, but the thought of zapping your pet made you think again? If so, you probably haven’t heard about our exclusive gentle products and training methods. With over 15 years experience in keeping pets safely secured, we know how to properly contain without harming your pet. When you choose Hidden Fence, Inc, you’re choosing the highest quality products and services at the best price. Our training technique will teach your dog his new hidden fence, and it will do so without frightening or stressing them out. As the name implies, this training uses numerous tiny little steps of harmless static corrections that feel much like tickles. The tickles really do feel like tickles, and we encourage you to feel them for yourself. We’re here to help. Our team is small yet effective. This allows us to give you and your dog first-rate personalized service. Should you trust us to keep your dog safe, you will likely be meeting with Nick (left) or Mike (right). Customer service is important to us and we desire to handle your inquiry as quickly as possible. Have a wire break or need other maintenance on your Invisible Fence® system? 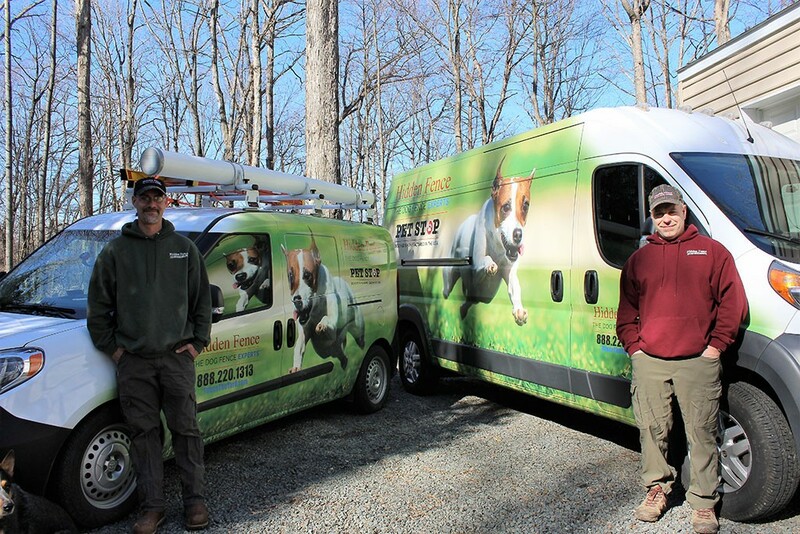 You can count on us to provide you with reliable service and repair, no matter what underground electric pet fence brand you’re using. We also offer special trade-in pricing for current Invisible Fence® brand owners. 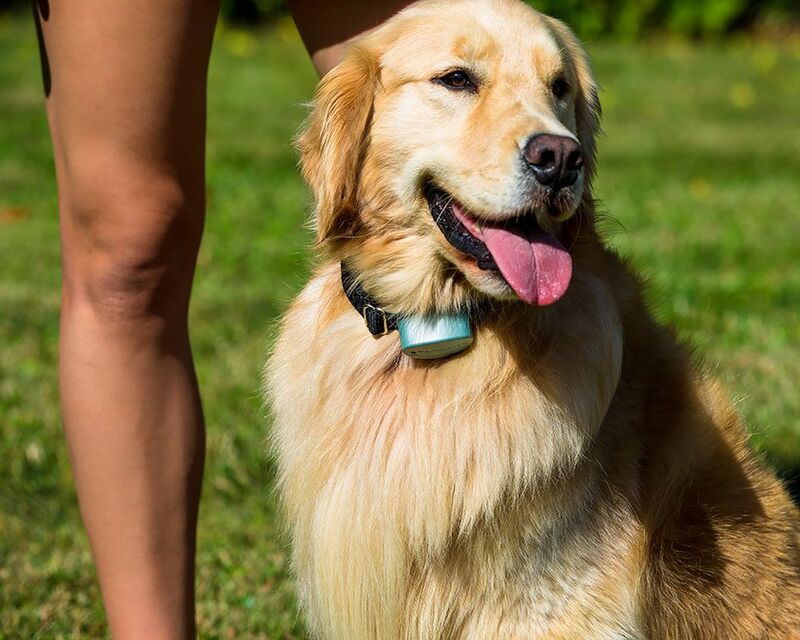 Keeping your pet safely and effectively contained is Hidden Fence Inc.’s top priority – that’s why we’re proud to provide you with Pet Stop® brand electronic pet fencing products and accessories. All Pet Stop® products are 100% made in the USA (designed, tested, and manufactured in Pennsylvania) and built with only the best materials, ensuring that you’re buying a quality, reliable product that will keep your pet safely and happily contained. 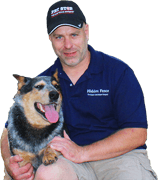 Your pet is in the best of hands with Hidden Fence Inc. and Pet Stop® – we guarantee it! We proudly serve Prince William, Loudoun, Fauquier, Warren, Stafford, Clarke and Frederick Counties in Virginia. Check out what our customers have to say about your local Hidden Fence Dealer! Fill out the form below to request a quote via email, phone, or in-home. Please provide any additional info. Do you (or your dog) have any burning questions? Can you tell me a little about your dog?